Two special pullouts produced by a weekly newspaper to mark a mediaeval king’s reburial have been made available free online. 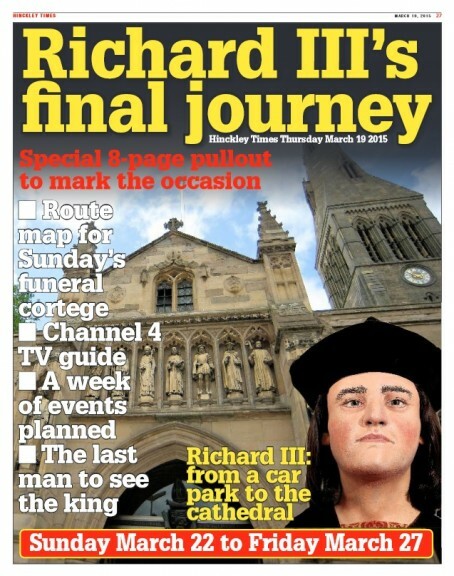 The Hinckley Times produced the supplements last month to commemorate the reinterment of King Richard III in Leicester. 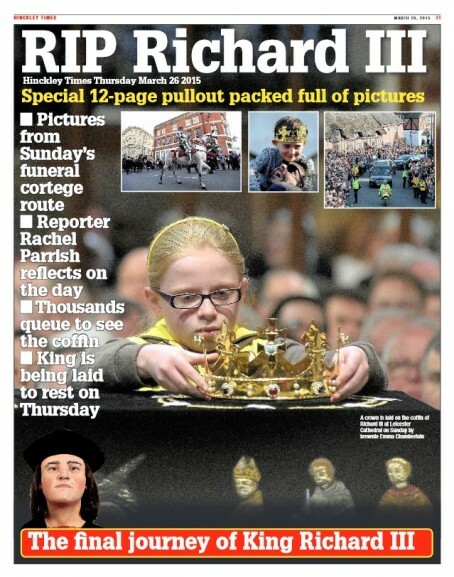 King Richard was killed in 1485 at the Battle of Bosworth Field, which lies on the newspaper’s patch along with much of the route which saw the Plantagenet monarch’s coffin paraded to his final resting place at Leicester Cathedral. HTFP reported last month how the Leicester Mercury printed thousands of extra copies of its own supplement marking the reinterment after an initial sell out saw history buffs bid more than £20 for the limited edition release on the internet. The Times’s two pullouts were published in its 19 March and 26 March editions. The initial eight-page preview of the ceremony, front cover pictured above, can be viewed here, while the 12-page review from the following week, pictured below, can be viewed here. Editor Simon Holden said: “The feedback on our coverage was really positive – with people writing in from overseas to say how much they enjoyed our reporting. The bones of King Richard had lain undiscovered under a car park for more than 500 years until they were discovered by scientists from the University of Leicester in 2012.